When we’re not using our creative skills to increase the value of our clients’ brands, we are spending time writing and designing for our sister company (no pun intended). Upper Notch Press is our creative outlet, where we combine original poetry and prose with original artwork to create prints, apparel, invitations, and any other medium we want to explore. We’ve set up shop on Etsy and have been adding products over the last few months that we’re excited to share. Have an upcoming wedding, bridal shower, housewarming, or other special occasion to shop for? 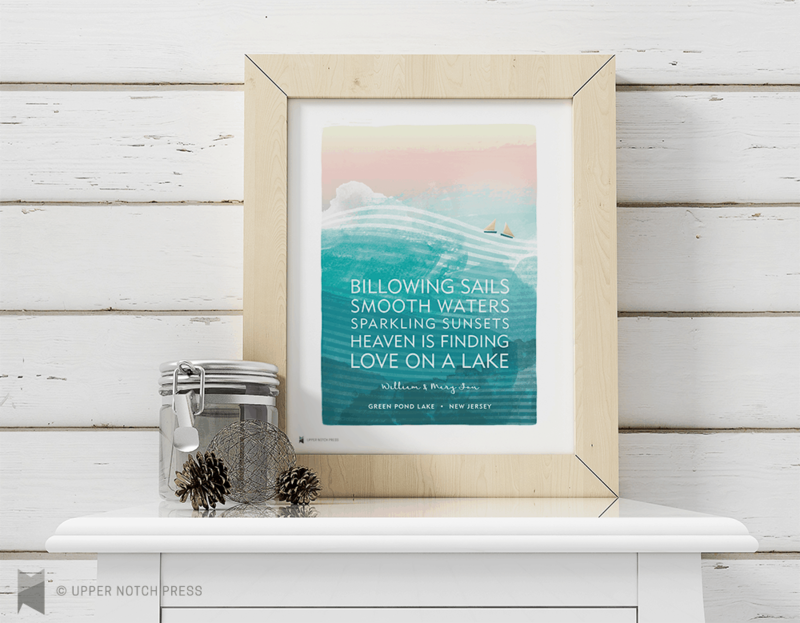 Check out our customizable “Lake Love” and “Heaven Is Finding Love on a Lake” prints, available in both blue and green in our Upper Notch Press shop. With three sisters and three weddings (five, if you factor in those of our lovely sisters-in-law) across seven years, plus all the wonderful unions we’ve been fortunate to celebrate with friends and family, it’s no hyperbole to say that we’ve had all things bridal on the brain for quite some time (further evidence: our posts about writing vows and making toasts). And beyond party planning and dress shopping, that includes a lot of conceptual (stay with me) thinking about how to distill a love story, with all its twists and turns and drama and—let’s be honest—total lack of drama, into a concise, sort of marketable thing: a real life fairy-tale set to a theme. You know which pairs have it blissfully easy when it comes to choosing one romantic thing to represent their love story? Those happy sailors with a beautiful lake in common. Doesn’t matter whether you actually do any sailing, or any boating at all, for that matter. (Though why wouldn’t you?) Loving a lake—the lake you grew up on or worked at as a teenager or even discovered an an adult and built your grown-up world around—together creates an automatic unity in your souls, a common point on your horizon you can look to when things get rocky. That’s the inspiration behind these two prints, which feature a duo of playful sailboats afloat on seersucker seas and can be personalized with names and a location. Though neither of us share our hometown lake (New Jersey’s Green Pond) with our husbands, we have many friends and family who do, and it’s heartwarming to see the love that lake communities create.